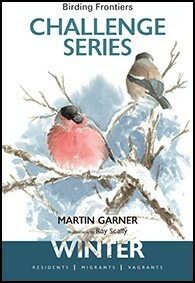 Winter is the second instalment in Martin Garner's innovative serialisation of seasonal bird identification topics. The popularity of 2014's premier title, Autumn, left the latest offering with much to live up to, but it delivers on many levels. The introduction, 'Discovery and Wonder', reflects on Martin's "always learning" mantra and serves as a reminder that open-mindedness is a fine trait to possess in birding. This vibe continues throughout the book, which adheres to the same structure, format and layout as its Autumn predecessor. The pages are busy but not cluttered; as with the previous title we have a QR code (for soliciting further information online) accompanying the main text, distribution maps and excellent photos. Once again, the book is brimming with the delightful artwork of Ray Scally. His diversity and adaptability is enviable: the intricate illustrations in the species accounts are naturalistic and accurate, yet his style has a welcome looseness to it, particularly exemplified by the elegant Bullfinch portrait on the front cover. Topics vary greatly across the book's 15 chapters, from charismatic 'winter' birds such as auks through to the somewhat less seasonable turtle doves. As with the Autumn title, Garner has deliberately varied the content to encompass not just extreme vagrants but also many more familiar taxa — or perhaps more accurately, unfamiliar taxa of familiar species. For anyone who follows the Birding Frontiers blog, it will come as no surprise that some of the key areas tackled are among Garner's particular interests: redpolls, eiders and Snow Buntings, for example. The first is a particularly fascinating section. Whatever your take on the status of the various redpoll taxa, Garner has presented this chapter in about as clear a fashion as I'd imagine is possible. He introduces a brand new 'Redpoll Code', which really typifies what this book is all about — opening new doors, paving new paths and ultimately educating the reader. The chapters set out identification challenges in a refreshingly thorough yet clear manner. Separating Richard's and Blyth's Pipits is a fine example of a troublesome species pair that is so often inadequately covered by field guides, yet here the six-page coverage could not be more comprehensive and as such is perfect for refreshing yourself on the subtle differences. Similarly, I think anyone would struggle to find a publication that tackles iliacus and coburni Redwings in such an efficiently effective manner. The same applies for the three forms of Snow Bunting covered in chapter 15 — extremely useful indeed. There's plenty here for all levels of birder, and I challenge anyone to pick up a copy and claim not to have learned something. When a borealis Northern Shrike turned up on Corvo, Azores, last October I found myself as bemused as I was impressed — I'll happily admit that I knew very little about the taxon, let alone that both it and its Siberian congener were readily identifiable and potential vagrants to Britain. The same applies to Blakiston's [Water] Pipit, covered in chapter 11. This is really testament to Martin Garner's continual willingness to explore the peripheries of contemporary bird identification, pushing boundaries and making discoveries along the way. It's more than seven years since his earlier Frontiers in Birding encouraged people to start thinking outside the box, and the wealth of fresh content in Winter testifies that there really is plenty still to learn. Both titles in this series have been truly great and I for one can't wait to see what the next two instalments have in store. Bring on Spring! Challenge Series: Winter by Martin Garner (Birding Frontiers).